This morning, walking around Anderson Farm (formerly owned by the late U.S. Senator Clinton P. Anderson, D-NM), I noticed some odd white substance scattered unevenly throughout the alfalfa. At first I thought they were puffballs, a type of mushroom. But some were oddly shaped, so maybe pieces of styrofoam? Finally I went close enough to take the pic above and determined that they were snow clumps. I was baffled–what kind of weather phenomenon was this? A quick use of Google provided the answer, for the same thing had happened in New York City last month. Here is a freeze frame of a video shot by NBC-TV news from their studios at Rockefeller Center where you can clearly see the clumps of snow. It’s a phenomenon caused by warming temperatures and mid-air clumping. 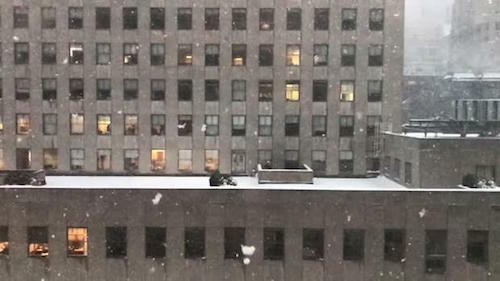 “Snowflakes can only form in below-freezing temperatures, of course, but when they fall into warmer air lower down, they can start to melt,” reported NBC New York meteorologist Erica Grow. 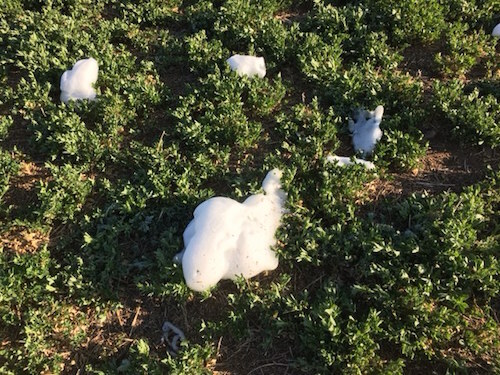 “That makes them sticky enough to clump together when caught in updrafts, which is fast-rising air typical of thunderstorms.” That alfalfa field is at an elevation of about 4800 feet. A fast-moving storm came through last night and the snow probably started falling from an altitude where the temperature was a little below freezing. The low temperature in the field was about 38 degrees, so the individual flakes melted, but the clumps did not, and temperature during my walk was 42 degrees and the clumps were just starting to melt when I took the above shot.